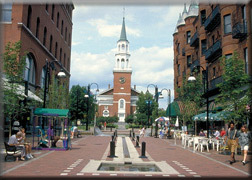 Downtown Burlington Vermont is an urban center buzzing with an abundance of activity and excitement. A dynamic Church Street Marketplace and gorgeous Burlington Lakefront frame the creative and cultural epicenter of Vermont's largest city. Burlington Vermont has so many attractions including fine dining, shopping, theaters and the historically acclaimed Flynn Performing Arts Center on Main Street, which regularly hosts popular performers and many fine theatrical productions. Just blocks away from the University of Vermont and Champlain College, Downtown Burlington is energized by the infusion of college students every fall. Many small businesses and entrepreneurs conduct their work in Downtown Burlington. Burlington residents show their local support of the Farmers Market on Saturday's during the growing season in City Hall Park. Citizens and visitors come together to share in the locally and organically grown produce. Downtown Burlington Vermont is a Media and Arts Center. Tourists and visitors come back to Burlington time and again simply because it is one of the most beautiful small cities in the US. Why not start in style in this sophisticated 1 bedroom Condo? This Condo is in a beautiful, historic red brick Victorian building that has been updated and converted to meet all your needs. It sits in an ideal location, a few blocks from downtown Burlington and the waterfront and a close walk to both the hospital and surrounding universities as well. You will love the 9 foot ceilings, original wood floors, and 2 full baths with 2 very large walk in closets for ample storage. Living room and bedroom are spacious and flooded with light. Lower level storage and a shared washer/dryer on site. Dedicated parking spot included. Association fee covers: heat, hot water, water/sewer, trash, snow removal, maintenance and master insurance. No rental cap. Turn-key Duplex with updated units and off-street parking! Hardwood floors, large kitchen, updated heating and private porches on both levels are among the list of highlights that draw tenants and keep these apartments occupied. Each unit boasts spacious bedrooms open to a lot of light and many updates all around. Tenants pay utilities! Johnson Street is a hidden gem in Burlington, just blocks from the top of Church Street Marketplace full of shops and restaurants; Burlington's picturesque waterfront; and the colleges/hospital that draw so many to live work and play in Burlington! Superb Burlington duplex ready for its new owners! Great floorplans and modern updates make these units easy to rent. Tenants always value having off-street parking, private porches for each unit, and even a garden space for relaxing or cooking out in warmer weather. Just blocks from the top of Church Street, this property is just minutes to Burlington's colleges, hospital, and downtown's best shops and restaurants. A great location and a great opportunity to invest in Vermont's most exciting city!